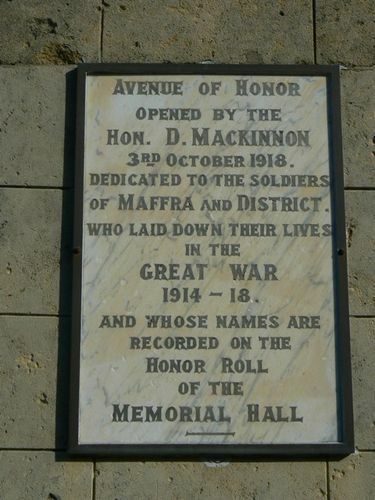 The plaque commemorates Maffra's Avenue of Honour which was planted by the Maffra Soldiers Welfare League in honour of men of the district who died in service or were killed in action in World War One. 139 men from the district paid the supreme sacrifice. The avenue no longer exists. The plaque commemorating the opening of the avenue is on the Maffra Cenotaph which was originally located at the start of the Avenue of Honour. The cenotaph was relocated to its current position & rededicated. The avenue was formally opened by Mr Donald Mackinnon M.L.A. on the 3rd October 1918 when the first 10 trees were planted. Attached to each tree was a copper plate which listed the name of the soldier honoured, his rank and battalion. The trees were planted along the Maffra-Sale Road. It is believed that some of the plaques from the Maffra-Sale Road are on a board in Shelton.